CEVA s RivieraWaves Bluetooth 5 dual mode IP is a complete and flexible solution for integration into SoCs/ASSPs. It contains both classic BR/EDR Bluetooth and Bluetooth low energy and is compatible with all Bluetooth versions from Bluetooth 2.1+EDR up to Bluetooth 5 dual mode. 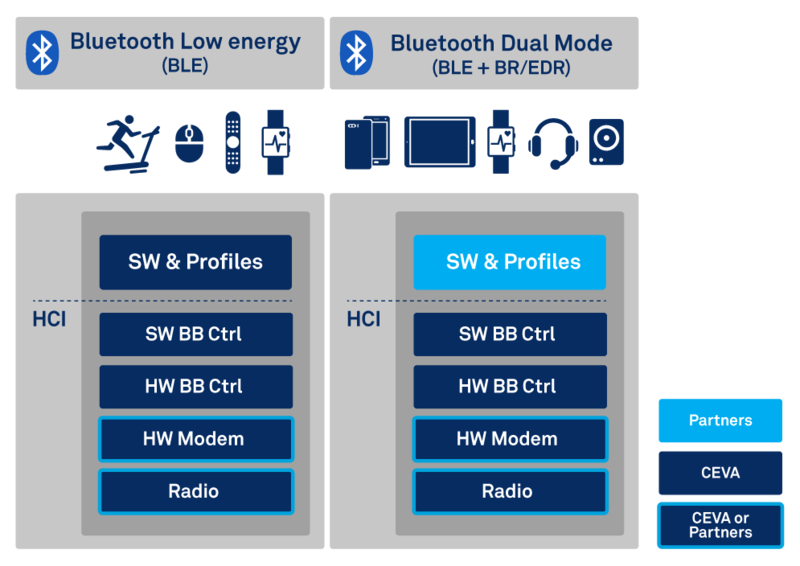 Compatible with the standard Bluetooth HCI, the RW-BTDM IP can be used with any Bluetooth dual mode host software protocol stack and profiles, either split around the HCI interface so that the lower layers and upper layers run on different processors or systems, or combined together to run on the same embedded processor for a fully hosted solution. The customer is free to choose any 3rd party Bluetooth dual mode compatible host protocol stack and profiles, including BlueDroid™ (as per Android™), BlueZ™ (linux), IVT, OpenSynergy, A&W and others. The firmware is provided with reference platform drivers and with a small and efficient message scheduler (or kernel OS) offering task management, inter-task communications, message (queues and events) management and timing management, for standalone use or integration into other real time OS. The software can run on any processor, including ARM Cortex M0/M3, ARC EM, Cortus, Andes, RISC-V, etc. The RW-BTDM-BB IP deliverable includes a hardware simulation test bench with regression test suit, synthesis scripts, and a user-friendly validation tool running under Window or Linux allowing easy unit testing and regression at system level. A processor agnostic turnkey fully integrated platform with embedded open source processor is also proposed as a cost effective and short time to market alternative solution. Backward compatible with all former Bluetooth versions (2.1+EDR, 3.0, 4.x).